This publication delivers a detailed introduction to these graceful insects from their well-known life cycle to their impressive protective mechanisms. 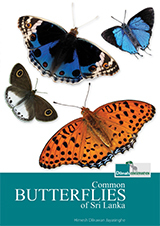 The publication primarily comprises of a colourful and comprehensive visual guide, identifying 100 different species of butterfly commonly found in Sri Lanka. In addition, 196 plants which play an important role in their population and distribution are listed in hopes of aiding the conservation of these beautiful winged creatures. 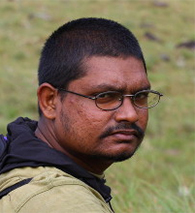 An active researcher in the field of ecology, Himesh Jayasinghe BSc. Engineering (Hons.) is a graduate of the University of Moratuwa. Encouraged by his father, a wildlife enthusiast, Himesh cultivated a special interest in butterflies and their conservation from a young age as a member of numerous environmental associations. Himesh is the Founder and President of the Butterfly Conservation Society of Sri Lanka (2013-14), the first author of ‘A Pocket Guide to the Butterflies of Sri Lanka’ and The Story of Sri Lanka Butterflies website. Dilmah Conservation, 111, Negombo Road, Paliyagoda 11830, Sri Lanka.